The Global Sync Atomic Travel Alarm Clock is a slim, accurate and elegant clock that slips easily into your luggage and enjoys cla...ssic good looks. The clock travels flat, in a pouch included with purchase, and features a unique twist-and-turn base to create its own stand. The clock is radio controlled and will pick up signals to set itself to local time for travel throughout the USA, western Europe, Japan and the United Kingdom. 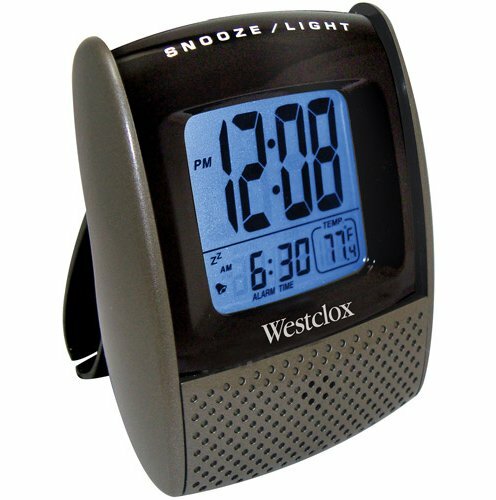 The face displays month, day and date, with an electroluminescent backlight, and the alarm has snooze functionality. Batteries are also included. Now available in 4 colors: matte silver, red, green and yellow.